IACT College is all about discovering talented individuals, nurturing their creativity and inspiring them to go the distance. 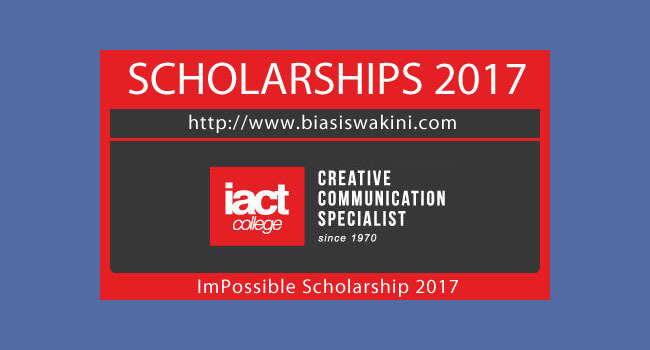 To support this vision and to ensure that all ImPossible Scholarship Champions 2017 stay ahead within the creative communication industry, IACT College is in collaboration with powerful industry players. - Up to 100% scholarship (waiver of total tuition fee) for stipulated tertiary programmes conducted at IACT College, Malaysia. - Lifestyle allowance for stipulated tertiary programmes conducted at IACT College, Malaysia. - Guaranteed a professional paid internship opportunity with a world-class company throughout his/her college career and will simultaneously be considered for a full-time employment upon graduation. 0 Komentar untuk "Biasiswa ImPossible Scholarship 2017"